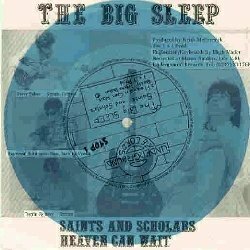 Big Sleep existed on and off over a 13 year period, during which time they recorded many demos and played many gigs. 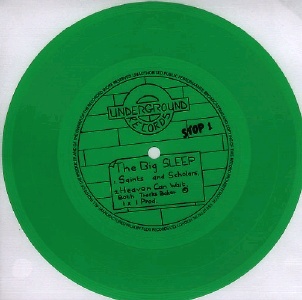 The original trio recorded the flexi disc in 1985. Raymond Robinson left sometime after, replaced by member(s) of The Keep. 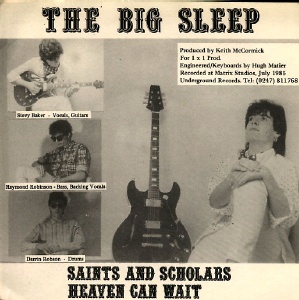 Robinson's cousin Kenny Armstrong (bass) played in a later version of the band, and Raymond himself recorded again with Big Sleep in later years. Terry Hooley financed the recording of "Saturday Blue" by a 3rd incarnation of the band in the 90s, but unfortunately the planned single release never came about. Darrin Robson currently runs the Fantastic Plastic label. 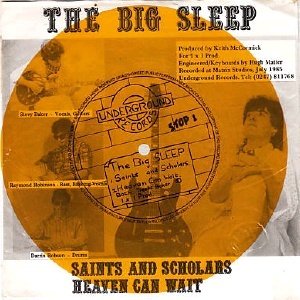 Big Sleep played the Guinness Festival Showcase gig in December 1986 in Belfast, which may have been recorded. Available as blue, yellow, green, black or clear vinyl flexi disc attached to a card. Recorded at Matrix Studios, July 1985. Engineered/keyboards by Hugh M. Produced by Kevin McCormick for 1x1 Productions. 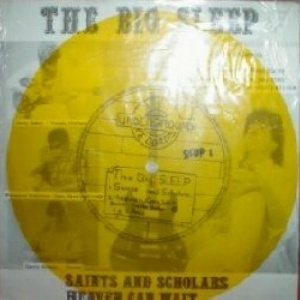 This release was financed by adverts for local businesses printed on the back of the card. CD - Hyped to Death - #49 - USA - 200?